Hey, who doesn’t like to play god once in a while? 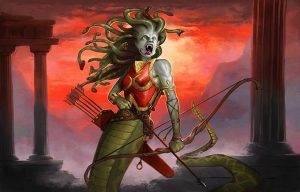 Especially the gods of Greek mythology, who loved to compete against each other using mortals and monsters as pawns. If this sounds like hella fun*, check out our just-launched Kickstarter for ARENA: FURY OF HELLAS — the first ever card game from Kobold Press! 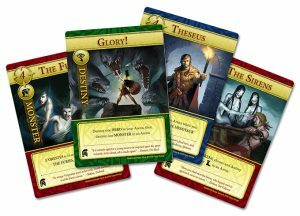 ARENA: FURY OF HELLAS a quick-fire non-collectible card game for 2 to 4 players. Each player represents the gods of Greek mythology, meddling in the fates and affairs of men and monsters alike for your own amusement. Your goal is to create an “Arena” of your own Heroes and Monsters, while keeping your opponents’ points as low as possible. Play is fast and furious as the epic demigods and heroes of yore clash among themselves, and against legendary monsters! The deck consists of 54 cards with 18 Heroes, 18 Monsters, and 18 Destiny cards. You only need a single deck to play, and most games wrap up in 15-20 minutes: perfect for a quick lunchtime game with your friends or co-workers, or killing time between panels at a convention. We’re happy to be working with designer Colm Lundberg of Love2Hate fame on this game. The cards are beautifully illustrated by longtime Kobold artist Bryan Syme (Deep Magic, Tome of Beasts, Rise of Tiamat, and many others). For more details including how to play, visit the ARENA: FURY OF HELLAS Kickstarter page and join us as a backer!